On the 20th March, also known as the first day of Spring, Persians (Iranians) celebrate their New Year. 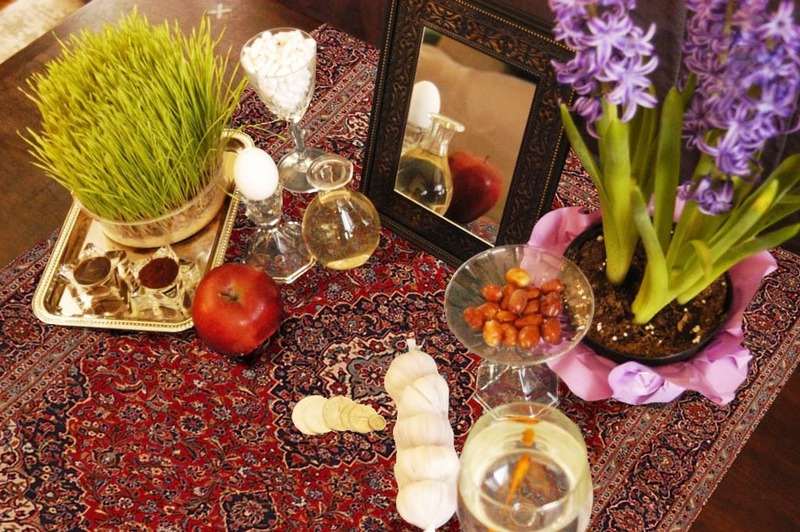 In the equinox calendar, the Nowruz represents the "New Day". All Persians around the world and other neighbouring countries which belonged to the Persian Empire (2,500 years ago) such as Turkey, Turkmenistan, Uzbekistan, Azerbaijan, Tajikistan, Afghanistan, some Pashtuns people in Pakistan and everyone who follow and practice the ancient religion of Zoroastrian, celebrate the New Year on this date. In short, Zoroastrians follow three main principals in life at all time: Good Thoughts, Good Words and Good Deeds. Nowruz traditions include preparing seven different symbolic pieces, known as the Haft-Sin where each item has to start with the letter "S" in the Persian language. They represent the ancient Persian culture and symbolises longevity, Love, wealth, good health, happiness, hope for the coming year. 1. "Sib" (Apple): Its main symbolic definition is "health." 2. "Sabze" (Grass): Symbolizes nature and exhilaration. 3. "Senjed" (Sea-buckthorn): Is an essential item which symbolises wisdom. 4. "Serkeh" (Vinegar): In Persian literature, vinegar represents ageing with grace. 5. "Samanu": Made from germinated wheat, is specially prepared for Nowruz and represents power and bravery. 6. "Seer" (Garlic): Considered as a stimulation symbol, some believe that it represents peace and not to invade others' rights. 7. "Somaq" (Sumac): Sumac is a symbol for Patience and Tolerance. The New Year celebrations last for the first 13 days of spring, full of joy and hope for the upcoming of spring where everything comes back to life. During this time, it is a custom to go and visit your relatives to regain news of each other and also to leave behind and to forget any possible past problems that it may have occurred. Children, in particular, look forward during the whole year to such festivity since they receive new clothes and gifts while visiting and welcoming guests and relatives. Many save money for such an event to purchase new items whether it is a car, an oriental rug, furniture, etc. In the spirit of Zoroastrian tradition, we will be offering a discount of 10% on all rugs purchased until the 31st March 2019. To receive your discount, visit our showroom in Wembley, from Monday to Friday from 09.00 am to 06.00 pm or by appointments during weekends. Since the beginning of time, weavers from nomad tribes used the natural resources they had available to create dye for the spun. After the thread for a carpet is completed, the next stage is to choose the colour and dye it. This process isn’t easy; it requires a lot of knowledge and accuracy. Some methods can be done over one day for one colour while other colours could take up to four days. Colouring yarn is a real art, and there are many different ways of doing this. One thing for sure, natural dyes are the best, and this is because they give the yarn a natural and high and hard to exceed its soft natural glow. Natural Dyes can formulate from either the plant and animal kingdom. For the colour Blue, a plant of the pea family called indigo is utilised; For the colour red, the root of the madder, kermes (chermes) and cochineal (dried lice) is used; yellow comes from saffron or pomegranate; Brown is usually applied from a walnut shell, oak bark. Even so, these techniques have evolved, and nowadays most rugs are made with synthetic dyes or a combination of both dyes which is not a bad thing. Synthetic dyes were introduced in1870, so it is not something new. 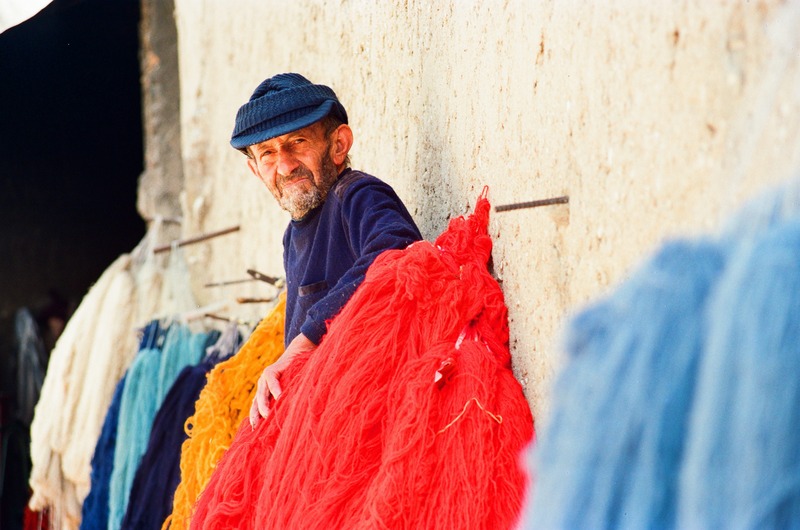 In the 20th century, weavers began to use better artificial colours known as chrome dyes. These were reliable and resembled natural dyes because they are sun and wash proof. It is considered to be identical to natural dyes, with the exception that it does not provide the same softness in the looks; Synthetic carpets get a harder, slightly metallic lustre which mitigates after about 10-15 years. Finding a combination of both natural and chrome dyes in a manufacturing a rug is not uncommon. The weaver uses the one that gives the best result for the purpose. It is common to use chrome dyes in a carpet’s details and natural colours to the backgrounds. Good synthetic dyes are just as suitable as vegetable dyes. It all depends on the correct procedure of dying and rinsing at the end, making sure no chemicals are left in the dyed wool which in time would cause damage and gradually weakens the wool fleeces. Making a pure vegetable dye rug generally works very expensive and is long if it is appropriately dyed, for example, you would need 1 kg of madder to dye one KG of wool and as you need a minimum of approx. 4 to 5 KG of wool for one sqm, soon the cost of the material exceeds most budgets; therefore, most weavers and producers use good quality synthetic dyes where you could dye 1 kg by using 10 Grams or less of artificial colours and have more control of the actual shade they wish to achieve. They also use and mix some vegetable dyes when dying the wool of attaining an unevenness in the tone and colour of the wool which most people find interesting and are more natural. Afghanistan which is situated in South Asia has encountered through long decades severe conflicts of war; including the Soviet Union, civil war and 13 years of a U.S.-led NATO combat mission. Traditionally, the Afghan rugs resulted from a combination of very ancient designs and patterns that are tied to specific towns and regions of Afghanistan. During the mid-80s, after Afghanistan’s conflicts that last for more than 50 years, Women weavers used as an inspiration what was happening in their surroundings, resulting in a textile phenomenon. Despite the impacts of the economic, cultural, and political influences of violence, there's a positive artistic outcome: history is reflected in the country's ancient art of rug making. The long-lasting techniques intersected with modern occurrences. War rugs include complex icons and symbols of war. Such as helicopters, tanks, machine guns and soldiers. 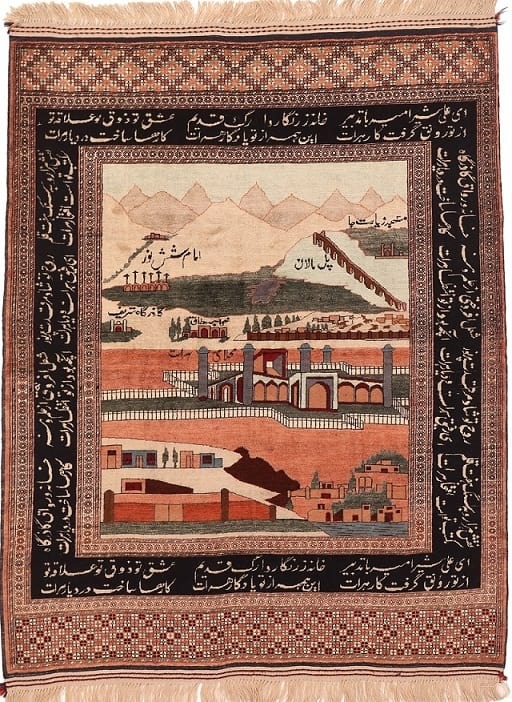 Firearms and other weapons were likely the most significant influence on the creation of war rugs, but other symbols like maps, local landmarks, and portraits are also favourite among weavers and buyers. Some rugs demonstrate stories, for example, Afghanistan beset by war and refugees fleeing to Pakistan. In the 90s as the machinery evolved, so did the rugs which then reflected the latest mechanism like American hardware (F-16s). Fascinated by the brutal history reflected in them, the Afghan war rugs made their way into more mainstream markets and are now collected by buyers around the world. 1- Try selecting a carpet which is different to the ground colour (main colour) of your living room. Having the same palette everywhere can make the room too bland and boring. For example, if you choose a rug which picks some accents of the colour of your sofa, it often works better. 2- Choose a contrast colour. For example, select the background and primary colour of the rug you like regardless of its contrast. Remember, as long there are some colours in the rug which are similar or of the same family to your sofa, curtain, etc. It should work. Don’t be afraid of introducing a colour that you like since you are going to live with that rug. 3- The colour of your hardwood floor or wall to wall carpet has little impact since your eyes would be directed to the rug rather than to the surrounding. Selecting a rug that goes with your hardwood floor is often irrelevant. 4- As long as there are similar colours or the same family colours that can be found both in your curtain and the rug you would be fine so don’t try to match the same colours as your curtains either. 5- Don’t compromise on the quality and longevity by buying a cheaper option. 6- The pattern of the rug is entirely personal, some like intricate and some prefer simple designs so go with what you like regarding design and don’t go for the safe choice. A handmade oriental rug is like a painting that you bring to your room; it often has a lot of history and culture so look at furnishing your place in that way. 7- People often ask: “would the rug last?” That depends on the traffic and quality of the rugs. The finer the knots, the more it will last. 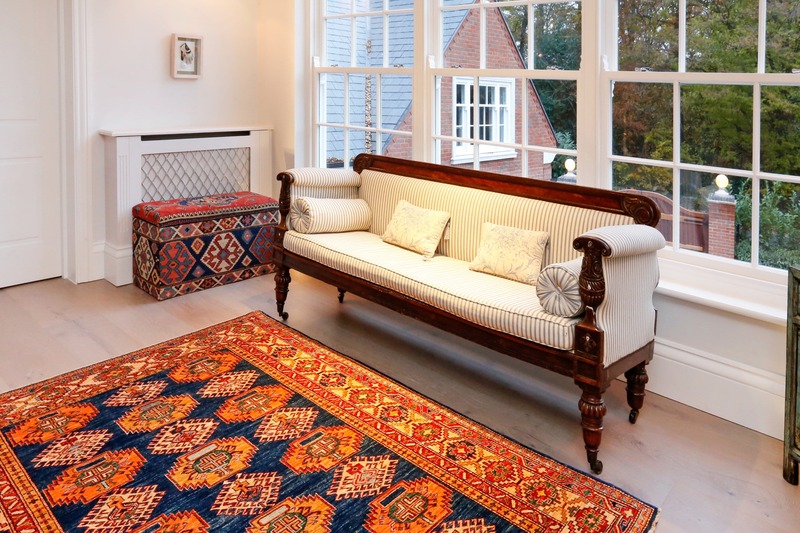 Our experience showed us that most good rugs combined with appropriate care from the owner, last for a very long time and generally surplus us, passing on to our children.